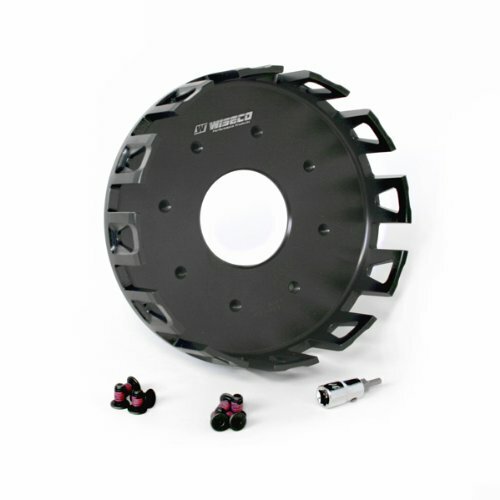 Wiseco leads the clutch aftermarket with high performance forged clutch baskets. OEM clutch baskets are made from inexpensive die-castings that quickly wear out and become easily notched. Wiseco offers the only forged clutch baskets in the aftermarket for off-bike and ATV applications. The feature aligned grain flow in the aluminum adds strength and toughness to the parts that are unparalleled through other manufacturing processes. Each Wiseco clutch basket, inner hub, and pressure plate start as dedicated forgings built specifically to take advantage of features that can only be made through the precision forging process. Variable fillet blends and complex surfaces can be forged into the part that would otherwise be extremely difficult to produce. The raw forgings are then precision machined to very close tolerances, producing the same high quality parts as Wiseco pistons. The finished parts are hard coat anodized and Teflon coated to offer superb wear resistance, and a long life of smooth clutch operation. Every new clutch basket is supplied with new components used during assembly, including new fasteners with pre-applied thread locker. Fits: Kawasaki KX250F 2004-2005, Suzuki RM-Z250 2004-2005. Wiseco leads the clutch aftermarket with high performance forged clutch baskets. OEM clutch baskets are made from inexpensive die-castings that quickly wear out and become easily notched. 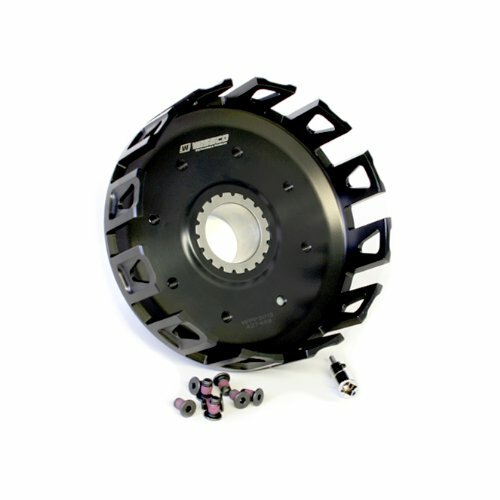 Wiseco offers the only forged clutch baskets in the aftermarket for off-bike and ATV applications. The feature aligned grain flow in the aluminum adds strength and toughness to the parts that are unparalleled through other manufacturing processes. Each Wiseco clutch basket, inner hub, and pressure plate start as dedicated forgings built specifically to take advantage of features that can only be made through the precision forging process. Variable fillet blends and complex surfaces can be forged into the part that would otherwise be extremely difficult to produce. The raw forgings are then precision machined to very close tolerances, producing the same high quality parts as Wiseco pistons. The finished parts are hard coat anodized and Teflon coated to offer superb wear resistance, and a long life of smooth clutch operation. Every new clutch basket is supplied with new components used during assembly, including new fasteners with pre-applied thread locker. Fits: Honda CR250R 1992-2007, CRF450R 2002-2007, CRF450X 2005-2009. Wiseco Clutch Basket Wiseco leads the performance aftermarket by producing the highest quality forged pistons for Dirt Bikes, ATV's, Snowmobiles, Outboard Marine and Motorcycles. Wiseco is unique because all of the pistons are forged in house. All of the forge tooling is also produced in the USA. All aspects of the manufacturing process is controlled, from the raw bar to skirt coating finished parts. Extreme racing conditions demand the strength and toughness that only forged pistons can offer. Compared to cast pistons, forgings are tougher and more durable, and will stand up to the abuse that high performance motorsport applications require. Most castings are brittle, have no grain structure and tend to fail catastrophically when the material yield strength is exceeded. Forgings have condensed grain that is aligned to the features of the part, which produces higher mechanical properties, and resistance to impact and fatigue. Each forging is designed to optimize the strength-to-weight ratio, and maximize performance. It is designed for the YFZ350 Banshee 1199 1987-2006. Wiseco leads the clutch aftermarket with high performance forged clutch baskets. OEM clutch baskets are made from inexpensive die-castings that quickly wear out and become easily notched. Wiseco offers the only forged clutch baskets in the aftermarket for off-bike and ATV applications. The feature aligned grain flow in the aluminum adds strength and toughness to the parts that are unparalleled through other manufacturing processes. Each Wiseco clutch basket, inner hub, and pressure plate start as dedicated forgings built specifically to take advantage of features that can only be made through the precision forging process. Variable fillet blends and complex surfaces can be forged into the part that would otherwise be extremely difficult to produce. The raw forgings are then precision machined to very close tolerances, producing the same high quality parts as Wiseco pistons. The finished parts are hard coat anodized and Teflon coated to offer superb wear resistance, and a long life of smooth clutch operation. Every new clutch basket is supplied with new components used during assembly, including new fasteners with pre-applied thread locker. Fits: Suzuki RM125 1992-2010. 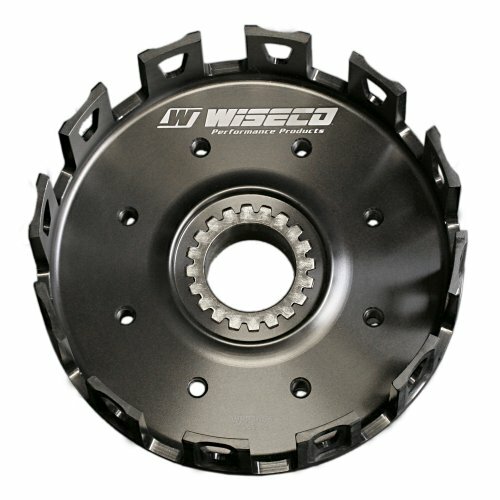 Wiseco high performance forged clutch components are the strongest on the market. Using our precision forging process, we combine the precision of forged aluminum with the strength of feature aligned grain flow. Each component is then CNC machined, hardcoat anodized, and Teflon coated. Wiseco Clutch Basket Wiseco leads the performance aftermarket by producing the highest quality forged pistons for Dirt Bikes, ATV's, Snowmobiles, Outboard Marine and Motorcycles in the. Wiseco is unique because all of the pistons are forged in house. All of the forge tooling is also produced in the USA. All aspects of the manufacturing process is controlled, from the raw bar to skirt coating finished parts. Extreme racing conditions demand the strength and toughness that only forged pistons can offer. Compared to cast pistons, forgings are tougher and more durable, and will stand up to the abuse that high performance motorsport applications require. Most castings are brittle, have no grain structure and tend to fail catastrophically when the material yield strength is exceeded. Forgings have condensed grain that is aligned to the features of the part, which produces higher mechanical properties, and resistance to impact and fatigue. Each forging is designed to optimize the strength-to-weight ratio, and maximize performance. It is designed for the YFM660R Raptor 2001-2005. 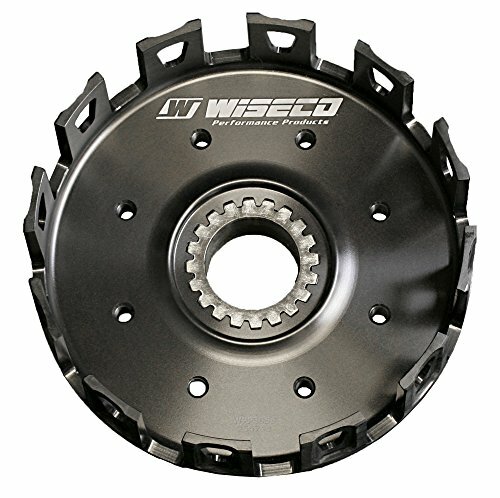 Wiseco leads the clutch aftermarket with high performance forged clutch baskets. OEM clutch baskets are made from inexpensive die-castings that quickly wear out and become easily notched. 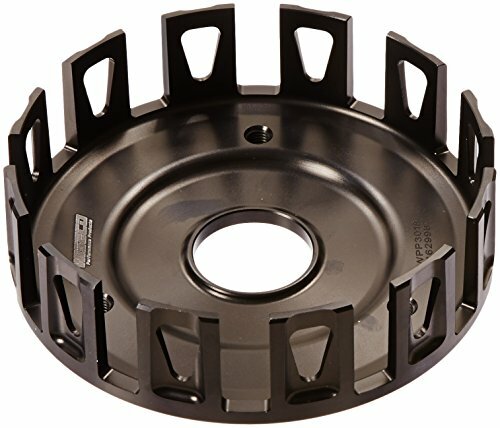 Wiseco offers the only forged clutch baskets in the aftermarket for off-bike and ATV applications. The feature aligned grain flow in the aluminum adds strength and toughness to the parts that are unparalleled through other manufacturing processes. Each Wiseco clutch basket, inner hub, and pressure plate start as dedicated forgings built specifically to take advantage of features that can only be made through the precision forging process. Variable fillet blends and complex surfaces can be forged into the part that would otherwise be extremely difficult to produce. The raw forgings are then precision machined to very close tolerances, producing the same high quality parts as Wiseco pistons. The finished parts are hard coat anodized and Teflon coated to offer superb wear resistance, and a long life of smooth clutch operation. Every new clutch basket is supplied with new components used during assembly, including new fasteners with pre-applied thread locker. Fits: Honda CR125R 2000-2007, CRF250R/X 2004-2009. Wiseco Clutch Basket Wiseco leads the performance aftermarket by producing the highest quality forged pistons for Dirt Bikes, ATV's, Snowmobiles, Outboard Marine and Motorcycles. Wiseco is unique because all of the pistons are forged in house. All of the forge tooling is also produced in the USA. All aspects of the manufacturing process is controlled, from the raw bar to skirt coating finished parts. Extreme racing conditions demand the strength and toughness that only forged pistons can offer. Compared to cast pistons, forgings are tougher and more durable, and will stand up to the abuse that high performance motorsport applications require. Most castings are brittle, have no grain structure and tend to fail catastrophically when the material yield strength is exceeded. Forgings have condensed grain that is aligned to the features of the part, which produces higher mechanical properties, and resistance to impact and fatigue. Each forging is designed to optimize the strength-to-weight ratio, and maximize performance. It is designed for the YFZ450R 2009-2010. 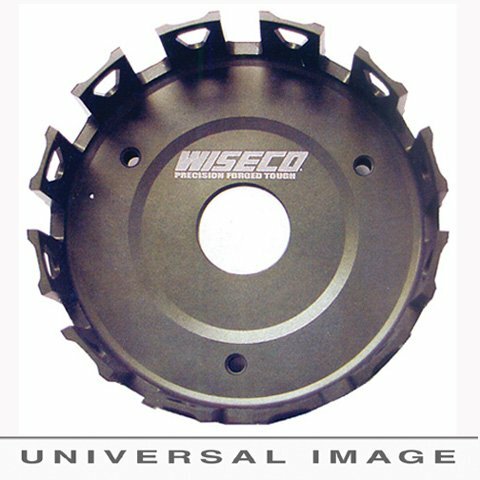 Wiseco Clutch Basket Wiseco leads the performance aftermarket by producing the highest quality forged pistons for Dirt Bikes, ATV's, Snowmobiles, Outboard Marine and Motorcycles in the. Wiseco is unique because all of the pistons are forged in house. All of the forge tooling is also produced in the USA. All aspects of the manufacturing process is controlled, from the raw bar to skirt coating finished parts. Extreme racing conditions demand the strength and toughness that only forged pistons can offer. Compared to cast pistons, forgings are tougher and more durable, and will stand up to the abuse that high performance motorsport applications require. Most castings are brittle, have no grain structure and tend to fail catastrophically when the material yield strength is exceeded. Forgings have condensed grain that is aligned to the features of the part, which produces higher mechanical properties, and resistance to impact and fatigue. Each forging is designed to optimize the strength-to-weight ratio, and maximize performance. It is designed for the YFS200 Blaster 1988-2006. 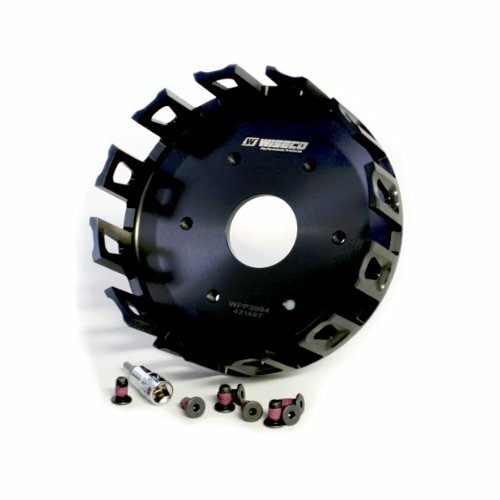 Wiseco leads the clutch aftermarket with high performance forged clutch baskets. OEM clutch baskets are made from inexpensive die-castings that quickly wear out and become easily notched. Wiseco offers the only forged clutch baskets in the aftermarket for off-bike and ATV applications. The feature aligned grain flow in the aluminum adds strength and toughness to the parts that are unparalleled through other manufacturing processes. Each Wiseco clutch basket, inner hub, and pressure plate start as dedicated forgings built specifically to take advantage of features that can only be made through the precision forging process. Variable fillet blends and complex surfaces can be forged into the part that would otherwise be extremely difficult to produce. The raw forgings are then precision machined to very close tolerances, producing the same high quality parts as Wiseco pistons. The finished parts are hard coat anodized and Teflon coated to offer superb wear resistance, and a long life of smooth clutch operation. Every new clutch basket is supplied with new components used during assembly, including new fasteners with pre-applied thread locker. Fits: Yamaha YZ85 2002-2012. Wiseco Clutch Basket Wiseco leads the performance aftermarket by producing the highest quality forged pistons for Dirt Bikes, ATV's, Snowmobiles, Outboard Marine and Motorcycles in the. Wiseco is unique because all of the pistons are forged in house. All of the forge tooling is also produced in the USA. All aspects of the manufacturing process is controlled, from the raw bar to skirt coating finished parts. Extreme racing conditions demand the strength and toughness that only forged pistons can offer. Compared to cast pistons, forgings are tougher and more durable, and will stand up to the abuse that high performance motorsport applications require. Most castings are brittle, have no grain structure and tend to fail catastrophically when the material yield strength is exceeded. Forgings have condensed grain that is aligned to the features of the part, which produces higher mechanical properties, and resistance to impact and fatigue. Each forging is designed to optimize the strength-to-weight ratio, and maximize performance. It is designed for the TRX450R 2200 2004-2009.